I've read previous threads on here on this topic before.... just checking if anyone has had the fix from the dealer where they install a gel pack in the headlight unit to absorb moisture? Was it a success? I've had a long struggle with two local dealerships & mercedes-benz UK on this matter, they kept telling me it was normal. Honestly it looks terrible its the first thing everyone commented on when they saw the car. To make matters worse I showed it to a MOT (annual car test required in the UK) test center technician and he told me it would most certainly fail the test and would require fixing. As the car would be out of warrant when this test would be due I'd end up footing the bill, something I wasnt at all happy with. Over a 4 month period I kept taking photos which clearly showed the moisture level was getting worse see the attached photos. After emails to the Mercedes-Benz CEO of both the UK & Germany, they finally have agreed to install the gel pack in both head lights to fix the issue, its due in for this work in another few weeks. Just checking on here if anyone else has had the same issue & possibly the same repair? what was your outcome? Did it resolve the problem? Had Gel Packs, they do not work long term. One headlight got damaged due to moisture getting into Ballast, Light blew out while car was in for service for unrelated item. Then they tried to blame me.... you will see Mercedes will fail at supporting owners. Nothing but the best is just like a Hollywood Lot, Looks great on the outside, but at the end of the day, its just another car... Its a great car when the quality holds up and they stand behind the product, but when they will not cover dumb things like door handle lights that blow out within 2 years, that's sad. Yes indeed it sound like a temporary solution for sure... surely they know these gel packs can only absorb moisture for a limited amount of time. Fact its most certainly a MOT test failure here in the UK, customers will be left with cars they can drive or insurance on UK roads.... not something I'd expect from such a high end car. I've checked similar cars online for sale in the UK and dealer photos are showing moisture too so its well known. My car is an early 2017 model, there was face lift model released in late 2017 with slightly different head lights (see below) i.e. there is a three strip day light led/ turn signal I wonder if the issue was resolved in this release.... anyone one here with a late 2017 or later model seeing the same moisture problems? 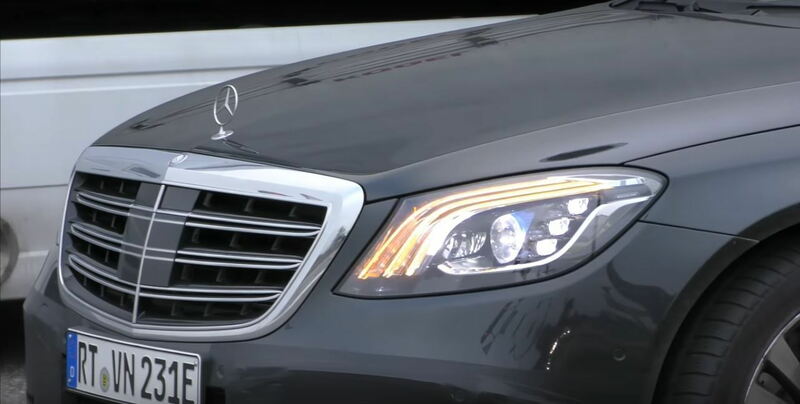 Maybe this is a possible solution request the newer facelift headlight units. Unlike headlights manufactured years ago that created heat inside the assembly and drove out moisture the newer bulbs such as LED’s run much cooler and thus the moisture problem. B2B. Although, in the interest of full disclosure, I do know one of the lead techs at said dealer and this got done without any pushback. It is sad however that I brought this topic up at other dealer and all were very nonchalant about it claiming more or less "it happens." I found this to be a ****ty response given that this is Mercedes and a S Class. Last edited by Rimola; 03-19-2019 at 01:19 PM. Just to come back with an update as I started this thread some time ago. I had the desiccant silica gel packs installed in both headlights over a week ago, havent seen any moisture issues since, Ill report back if things change. They didnt have to remove the front bumper in the end to do this work.... just letting anyone else know as I was kinda worried about that. For anyone out there no getting anywhere with this issue, i was in a similar position until I emailed the Mercedes CEO in both the UK & Germany expressing my disappointment with this issue, within a week I got a call to say they had the parts for the repair. Prior to this my local dealer told me they wouldnt be doing a repair until droplets formed on the inside of the headlight. Just a heads up for anyone else.